My favorite things to make for friends are simple delicious, party-tizers that taste like you were forced to slave over them, when in reality...they take a matter of minutes. These are perfect for any occassion and even those that "think" they aren't a fan of dates will RAVE over them (By the way, I was one of those people at one point). You can make this recipe with or without the chorizo and it's amazing. 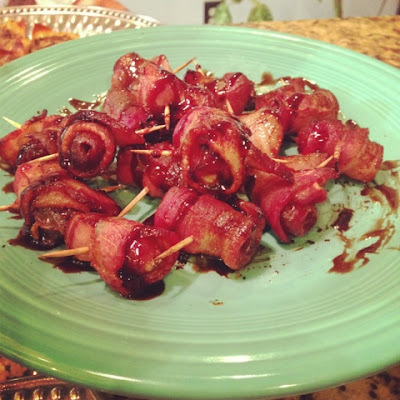 I just LOVE chorizo and was blown away by Park Cafe in Nashville's Chorizo Stuffed Bacon Wrapped Dates (that's a mouthful to say) this summer when I visited with some friends. I have been meaning to make them and just hadn't gotten around to it, not that I have anything else going on in my life right now to keep me busy ::cough cough:: radio tour ::cough cough:: But, I recently went to movie night at a sweet friends house, who also happens to love a little gourmet-inspired cooking and she whipped these up for us and it reminded me that I have yet to get you guys this recipe! Let me know what you think. Preheat your oven to 400 degrees. Make a small cut to allow you to stuff the dates with the chorizo. Stuff the dates with the chorizo and press shut. Now take a piece of bacon and wrap around the body of the date and secure with a toothpick. Place the stuffed bacon wrapped dates on a baking sheet lined with foil. Bake for 7-8 minutes or until top of bacon starts to crisp, turn the dates over and roast for another 7-8 minutes. Bacon should be cooked through and crisp, especially on the edges. Remove from the oven and let cool for 5 minutes. Drizzle with the balsamic glaze and serve warm.